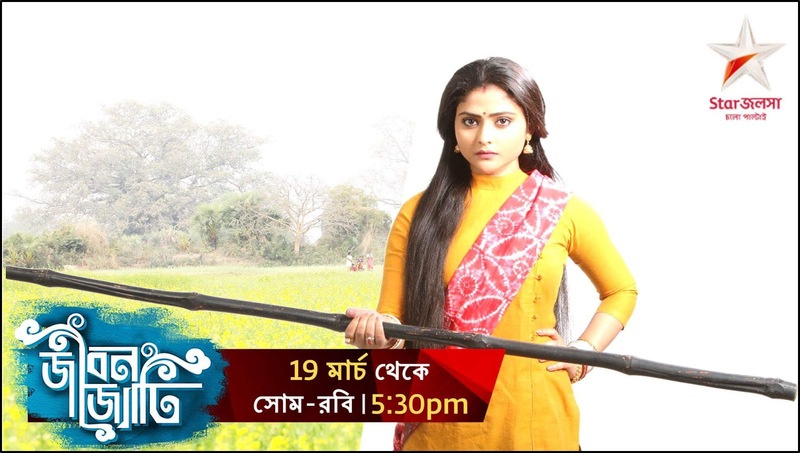 The popular Bangla channel Star Jalsha is all set to launch a new show titled 'Jibon Jyoti'.Set in rural Bengal, it’s a compelling role reversal love story of Jyoti, who is not only adept in lathikhela, expert in combat but also a dutiful, brave, deep rooted to her values and beautiful woman who passionately believes in protecting her husband come what may. The story is set in the backdrop of rural Bengal. Jyoti’s father Kinkar Senapati is the bodyguard of Suryakanta a rich businessman and father to Siddhartha. One day Kinkar saves Suryakanta’s life by taking a bullet on him. One day Siddhartha who stays abroad comes to the village along with Rusha his girlfriend and Jyoti vows to protect them both as a legacy that runs in her family. A woman bodyguard is disowned by every other people in the village but Jyoti proves her worth by saving Siddhartha life. Siddhartha’s fiancée Rusha escapes from the village with the help of Jyoti. As Siddhartha’s marriage with Rusha fails, he decides to punish her by marrying Jyoti. Thus begins the love story of Jyoti who falls in love with a person in spite of being his bodyguard.